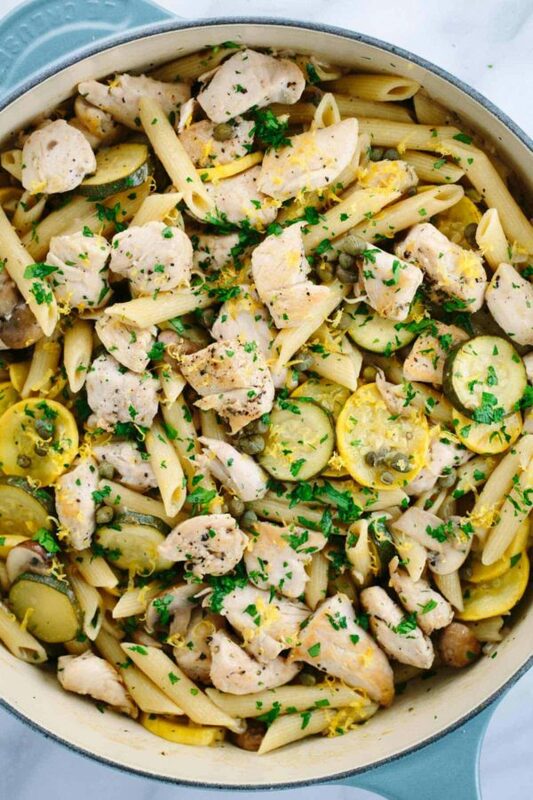 This one-pot lemon caper chicken piccata recipe is served with penne pasta and seasonal zucchini. It’s a quick and easy Italian meal in less than 30 minutes. Who’s ready for some PASTA!? Italian noodles that are warm and delicious, this recipe, adds your favorite chicken piccata ingredients in one pot. To make this an all-in-one meal, I’ve added some gorgeous summer squash and lots of lean white meat. You might not have the time to make all of the separate components to a classic chicken piccata dish, so I’ve slimmed down the steps and made it easier to enjoy all of the goodness in one forkful. If this sounds like a good game plan, keep reading! My large covered pan has been a lifesaver! 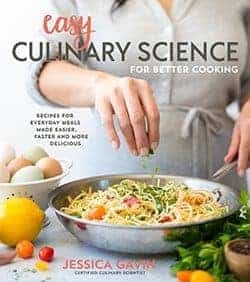 I’ve found that one-pot pasta meals with ingredients that are similar in size are faster to cook and easier to eat. If you had the pleasure of feeding or eating with a child, you know that you need to devour at lightning speed. 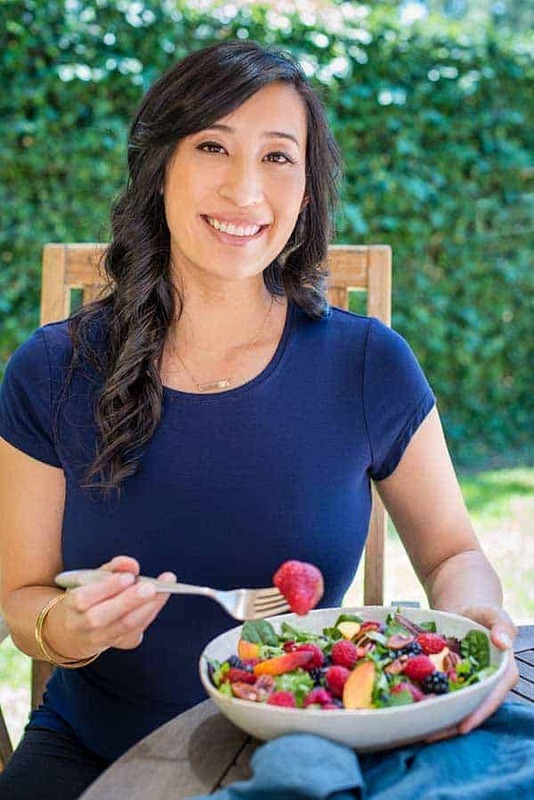 There’s not much time to cut up your food properly with a knife, and smaller handheld bites work great when your kids are eating solids. Jason loves my chicken piccata recipe, but I thought I would create something with a little less fuss so we could get through dinner time a bit more smoothly. I use chicken tenders, the pieces you see typically used in chicken nuggets or strips. Yes, they do exist! They are the long characteristic pieces of white meat loosely attached to the underside of each breast. Each chicken has two. You can use chicken breast as well for the recipe and just cut them into 1-inch cubes. It’s just convenient and easier to cut up the smaller chicken tender portions when you’re strapped for time. The flavor and texture of tenders are the same as breast meat, so grab whichever you prefer. Each piece is lightly browned on either side in a pan to cook through, set aside, and then the rest of the ingredients are ready to toss in for the grand finale! The lemon caper sauce is a simple combination of white wine to add some depth, savory chicken broth, fresh lemon juice, and zest. A little bit of flour helps to quickly thicken the sauce right in the same pan. The tiny capers add a mighty tang and savory note to each bite. It’s seriously addicting. Hearty noodles, tender chicken, fresh vegetables and a light sauce, check! You’ve got all that you need for a satisfying and balanced meal. Who brought the Chianti? How do you select the right pasta for your sauce? There are a lot of noodles in the market, how do you know which to choose? Simply remember that the sauce guides the selection of the pasta. Tubes like penne are ideal for hearty or thicker sauces. I used Rigate noodles with ridges in the chicken piccata recipe because it grabs more sauce, so you get more even coating. Flat and wide ribbons like pappardelle are good for creamy sauces, generally the wider the noodle, the heavier the sauce. Long round rod noodles like spaghetti are good for olive oil and tomato based sauces because each noodle is coated evenly. Delicate sauces like a lemon would go well with a thinner angel hair pasta. Shapes are perfect for vegetable sauces like pesto, or cheesy sauces, so all of the crevices hold on to the sauce with ease. These are just some basic suggestions, experiment and have fun with different combinations to see what works best! This one-pot lemon caper chicken piccata recipe is served with penne pasta and seasonal zucchini. It's a quick and easy Italian meal in less than 30 minutes. Cook pasta according to package directions, drain and set aside. Meanwhile, make the chicken piccata. In a medium sized bowl, season chicken with salt and pepper. Heat 1 tablespoon olive oil in a deep skillet over medium-high heat. Add chicken to the pan in a single layer. Brown chicken on one side for about 3 minutes, then flip and brown the other side for 3 minutes or until cooked through. Transfer to a clean plate and set aside. Reduce heat to medium and add 1 tablespoon olive oil, 1 tablespoon butter, garlic and shallots to the skillet. Saute for 3 minutes, stirring constantly. Add zucchini and mushroom, saute for 4 minutes until just tender. Add flour, stir and cook for 2 minutes. Make a well in the center of the vegetables and add in wine and whisk until the liquid reduces, about 1 minute. Whisk in lemon juice, lemon zest, and broth. Stir in capers and parsley. When the liquid start to bubble and thicken, about 3 minutes, add the chicken back into the pan for 1 to 2 minutes to reheat. Stir in about ¾ of the cooked pasta. There will be extra left over. Taste the pasta and season with more salt and pepper as needed. Serve pasta with additional lemon wedges if desired and sprinkle with more parsley right before serving. 1) Whole wheat, gluten free, brown rice, quinoa or your favorite noodles can be substituted. 2) Whole wheat, spelt, or gluten-free flour can be used instead of all-purpose flour. 3) Top with Parmesan cheese if desired. 4) Serve with lemon wedges for extra tang if desired. 5) You can substitute chicken breasts for chicken tenders. Super yummy! Makes a lot and reheats well. Thanks for another great meal?